For its first installation, 1.26 was suspended from the roof of the 7-story Denver Art Museum above downtown street traffic to commemorate the inaugural Biennial of the Americas. The City of Denver asked the artist to create a monumental yet temporary work exploring the theme of the interconnectedness of the 35 nations that make up the Western Hemisphere. She drew inspiration from the NASA Jet Propulsion Laboratory’s announcement that the February 2010 Chile earthquake shortened the length of the earth’s day by 1.26 microseconds by slightly redistributing the earth’s mass. A 3-dimensional form of the tsunami’s amplitude rippling across the Pacific became the basis for the sculptural form. Exploring further, Echelman drew on a National Oceanic and Atmospheric Administration (NOAA) simulation of the earthquake’s ensuing tsunami, using the 3-dimensional form of the tsunami’s amplitude rippling across the Pacific as the basis for her sculptural form. The temporary nature of the Biennial and its accelerated timeline precluded the artist’s use of a permanent steel armature, as employed in her previous monumental permanent commissions. Instead, 1.26 pioneers a tensile support matrix of Spectra® fiber, a material 15 times stronger than steel by weight. This low-impact, super-lightweight design makes it possible to temporarily attach the sculpture directly to the façade of buildings – a structural system that opens up a new trajectory for the artist’s work in urban airspace. 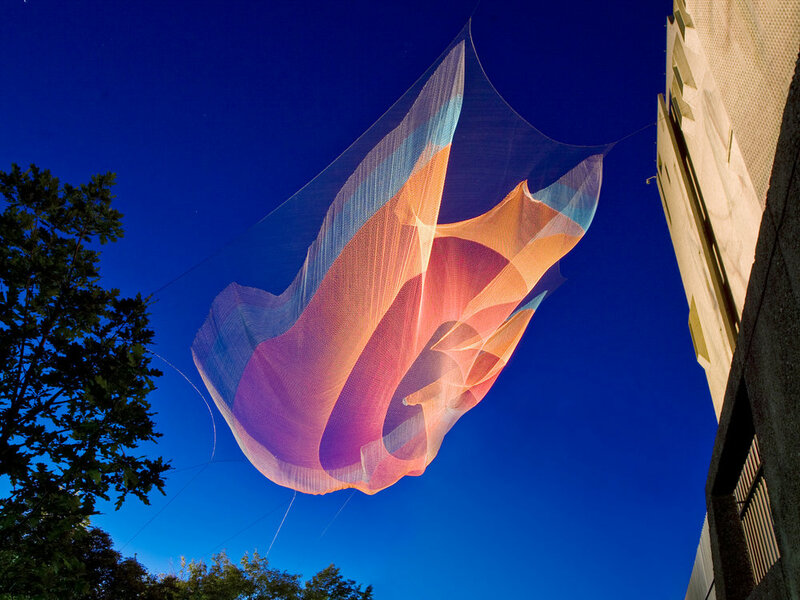 The soft materials allow the artwork to be animated by the wind. Its fluidly moving form contrasts with the rigid surfaces of the surrounding urban architecture. At night, colored lighting transforms the work into a floating, luminous form while darkness conceals the support cables. A book about 1.26 includes an essay by Sanford Kwinter, Professor of Architectural Theory and Criticism at the Harvard Graduate School of Design, cofounder of the journal Zone and Zone Books, and author of Architectures of Time: Towards a Theory of the Event in Modernist Culture. Material Donor: Spectra® Fiber: Honeywell, Inc.